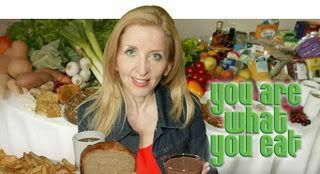 So, I'm in love with this UK show called "You Are What You Eat." They take these people's entire week's worth of food intake and analyze it. They also put the equivalent on a big table for them to look at in hopes it will scare the crap out of them, or at least embarrass them. I'm going to do this for my diet. I'm taking the last week, and analyzing it tonight. I will be putting together a table and doing a photo of it tomorrow. Overall, I'd say that looks pretty damn good. I could be eating less in the way of carbs, but all of them come from whole grains, brown rice, fruits and veggies. The calories on here are taking into account pure consumption, not counting the calories I burned off through exercise. ...etc. Except mine won't be bad food, nor will it be British. When I had TV I loved "You are what you eat"! Its so very witty and honest about health. I love that show too. I guess I'm an occasional OREO. Of course with dunking milk.